Whether you’re facing the reality of a personal meth addiction, or you’re learning about the addiction of a loved one, it’s important to understand what it really means. An addiction to meth is a serious illness that requires treatment to overcome. Armed with the right knowledge and resources, you can get on the path to recovery or guide loved ones in the right direction. Meth primarily comes as a white powder. Meth users may snort, smoke, dissolve into water and then inject it or even consume it orally. While all forms of meth consumption are dangerous, smoking and injecting meth are riskiest because the high comes on much faster, encouraging more frequent use. Meth is a Schedule II drug. It can, technically, be used for some legitimate medical purposes. In some cases, medical professionals prescribe low doses of meth have to treat conditions like attention deficit hyperactivity disorder. The overwhelming majority of users, however, use meth recreationally and with no medical supervision. Even infrequent use of meth can cause problems like a rapid heart rate, increased blood pressure and irregularities to body temperature. Chronic use as a result of meth addiction, however, causes far greater problems with lasting negative effects. These side effects of an addiction to meth may be physical, emotional or financial, just to name a few. An addiction to meth, like any other substance abuse problem, can lead to broken relationships. Individuals might lie to their friends and family rather than be truthful about their addiction. 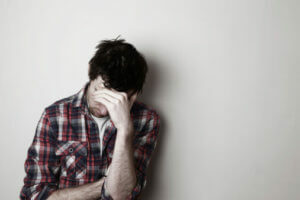 Feelings of shame and guilt might also encourage isolation, which only makes the problem worse. From a physical standpoint, an addiction to meth can cause a number of serious problems. Common concerns for users are severe dental problems, chronic scratching that can cause skin sores and extreme weight loss as well as malnutrition. Other potential health problems include increased rates of sexually transmitted diseases and communicable diseases thanks to shared needles or risky sexual behavior. To explore why people develop meth addictions in the first place, it’s important to remember that addiction is never a choice. It’s not a personal flaw, but a diagnosable illness. Like any illness, there are many different contributing factors that can lead to the development of an addiction to meth. First, there are individual traits that cause some people to develop addictions while others don’t. There’s a genetic component at play that makes some people more susceptible to addiction. Personality traits also play a role, with serious risk takers more likely to try meth and then develop an addiction. Many individuals who have addictions to meth started taking the drug recreationally or to self-medicate a mental illness. It might have been a way to feel better, try to lose weight or deal with social anxiety. Over time, however, casual use leads to a dependence. Once this happens, trying to quit can feel overwhelming. Once patients recognize an addiction to meth, they can begin to treat the illness. This starts with a detox, and then it leads to time in a rehab facility. Various therapies can address the root cause of addiction, offer a comprehensive approach to recovery and then address any potential risks of relapse. A meth addiction is a serious challenge, but recovery is possible. At 1st Step Behavioral Health, patients receive targeted treatment through a variety of therapies and programs. Call 866-319-6123 to begin the journey away from meth addiction and towards lasting sobriety.